1. Peak Oil: Oil drives the world economy. 2. Climate Change: Currently we are experiencing Global Warming, but this will likely change to become Global Cooling from 2012 onwards. 3. World Overpopulation: Heading towards 7 billion, but occupies only 30% of land surface. 4. Clash of Civilisations: Materialism vs. Spirituality is not the same as Islam vs. Judeo/Christianity. There has been disingenuousness on both sides. 5. 2009 World Recession: The evidence suggests that the world economy is already in recession. US Public debt is $9.4 trillion. This fact, together with the sub-prime credit crisis, is rendering the United States Federal Reserve Board impotent to act. The solution lies in wealth creation activity, not in banking or finance. The BRIC (Brazil, India, Russia and China) economies have not (yet) reached the critical mass required to drive the world economy; and Peak Oil will inhibit this from happening. 6. Nuclear Power is not the way to go: This will likely lead to a “muddle through” resolution of problems in the West, and a possible contraction of human population to 4.4 billion people by 2030. i.e. If nuclear is embraced, up to 2.5 billion people will likely die within a single generation, because third world countries will not be given access to this technology. Unless we think in terms of “energy per capita, world-wide”, the scenario as depicted in the chart below (Source: Olduvai Theory, Richard Duncan, PhD) is the likely outcome. Humanity needs to close ranks. Just as the heart, the brain and the lungs, etc., all have discrete roles to play in the human body; so all elements of human society have roles to play in healing our planet. Think of the bee and the beehive. There is both value and dignity in our differences. The time for egotistical behaviour has passed. It is not a question of “who” is right. It is a question of “what” is right. It is time for humility. There are several alternative energy technologies besides nuclear – two of which are referred to in the ancient Religious Testaments. These two are not (yet) being seriously considered by scientists. (Ranked in the author’s subjective order of desirability. Still conceptual and not yet validated. However, evidence is beginning to emerge that the traditional argument against this concept - namely that “over-unity is not possible because it breaches laws of thermodynamics” - may be too shallow and/or flawed. Overview explanation outlined in Beyond Neanderthal. Could possibly replace coal and nuclear for electricity generation. High hopes. At face value a very sensible alternative energy technology; and high lipid algae may also be used to create downstream economic value-add in food, pharmaceutical, plastics and textile industries. High hopes. Possible issues if the world enters a period of cooling and ambient temperatures fall by 10 degrees Celsius. Probability of global cooling after 2012 is not low. IPCC scientists appear to have missed some key macro issues. In this light, solar technology is probably more suited to warmer areas of the planet – where temperatures in summer currently reach around 35 degrees Celsius and higher. High hopes. Cost of separating hydrogen from oxygen in water has been an issue up to now, but this issue may be addressable by solar and wind energy technologies being used in tandem with hydrogen as by-product. In addition to an investment in production infrastructure, this will require between $1.5 - $2 trillion investment in storage and distribution infrastructures across the planet, including conversion of up to 200 million existing internal combustion powered vehicles. This size of investment will likely be very economically stimulative. Well proven technology which can produce synthetic diesel at a cost of less than $50 a barrel. There is a role for this technology if localised over-unity energy scavenging technologies prove viable. Coal fired power stations will become redundant and can be retrofitted with FT technology – in which case, cost per barrel will likely fall to less than $30 per barrel and CO2 emissions will plummet. Up to 33% of all electricity produced is wasted through friction heat in overhead cables. Very sensible technology. Can reclaim waste and turn it into a valuable commodity. High hopes, but will probably supersede liquid hydrogen after the storage and distribution infrastructures are in place; and the population of legacy internal combustion engine cars has begun to contract. Sensible, but limited ability to create downstream economic value add. Some domestic applications emerging. Sensible, but limited ability to create downstream economic value-add. A particularly ill-advised way forward in context of food needs of global population. For many months, this analyst has been alluding to the fact that Gold is fundamentally the most valuable commodity on the planet and that its value is unrelated to money or currency. With Beyond Neanderthal now available to purchase at www.beyondneanderthal.com the time has come to “open the kimono”. Science is now beginning to discover that gold resonates at subatomic level on the same wavelength as DNA; and its ability (in modified form) to store electrical charges has already been proven. The technology is still embryonic but if the best available minds are applied to the challenge, this amazingly versatile element on the periodic table might possibly be incorporated into technological applications within 5-7 years. Further, given that science is now starting to understand the relationship between gold and DNA (just type the words “gold and DNA” into Google to verify this) the evidence is beginning to emerge that there really is no conflict between religion and science. Religion tells “what” and science tells “how”. Gold played a high profile role in the Old Testament because the Ancients understood its value. Gold did not derive its value from its colour or its sheen or the fact that it did not tarnish. These are facile reasons. One could argue the same about a polished coloured rock. The DNA linkage is a far more compelling reason as to why it became so sought after in the first place. References to gold’s exceptional physical properties are peppered throughout the Testaments. It’s just that science hadn’t caught up yet to understand. On the other hand, Sir Isaac Newton was way ahead of his time. It seems likely that he came to (vaguely) understand its value by studying the Old Testament and having devoted one third of his adult life before the age of 50 to alchemy. Of course, he had no idea of DNA, but his thoughts very likely revolved around then extant thought paradigms such as “elixir of life” or “holy grail” type concepts. Circumstantial evidence points to this as the likely reason why he resigned his job as University professor and moved, as Master of the Mint, to put Great Britain on a Gold Standard. From another perspective, it is now also becoming apparent that the “dogma” of religion is what has given rise to the cognitive dissonance regarding religion throughout the ages. In the absence of scientific understanding, people tend to invent answers. Clashes occur when “your” invented answer disagrees with “my” invented answer. But it does not follow that subjective dogma negates the objective importance of the Religious Testaments. Now that its hidden codes are increasingly capable of being cracked, the argument that the contents of the various Religious Testaments are merely apocryphal is losing credence. Beyond Neanderthal devotes a couple of chapters to investigating the overlap between the Holy Qur’an and the Old Testament and, not surprisingly the two Testaments have more in common that in conflict. Dogma aside, they reinforce each other. Realistically speaking, could it be a mere “coincidence” that six separate models point to 2012 as a critically important year? The good news is that the window of opportunity is still open to enable us to adapt our behaviour. I am hereby requesting that you purchase a copy of Beyond Neanderthal and tell all your friends and associates – so that the good news can be spread as quickly as possible. We are running out of time. 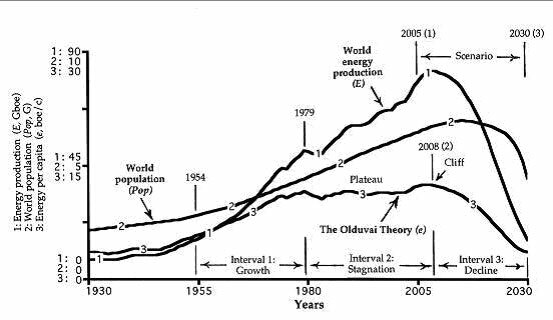 The Olduvai Theory’s forecast is based on the combined energy-equivalent numbers of coal, oil, natural gas, nuclear and hydro-electric. Table 1 contains 10 reasonable alternatives which have the ability, in combination, to ameliorate if not avoid the forecast catastrophic consequences. From an investment perspective, all of the technologies listed in Table 1, Items 1 to11 – in particular gold – seem to offer good long term investment opportunities based on fundamentals. However, in light of the possibility that we may be headed for a period of cooling, those that are weather dependant (such as solar) should be assessed with circumspection. Personally, I am attracted to items 1-7, in that order, but with the scavenging technologies to be treated as “wild cards” at present. There are three or four contenders within this category, only one of which is examined in some detail in Beyond Neanderthal. 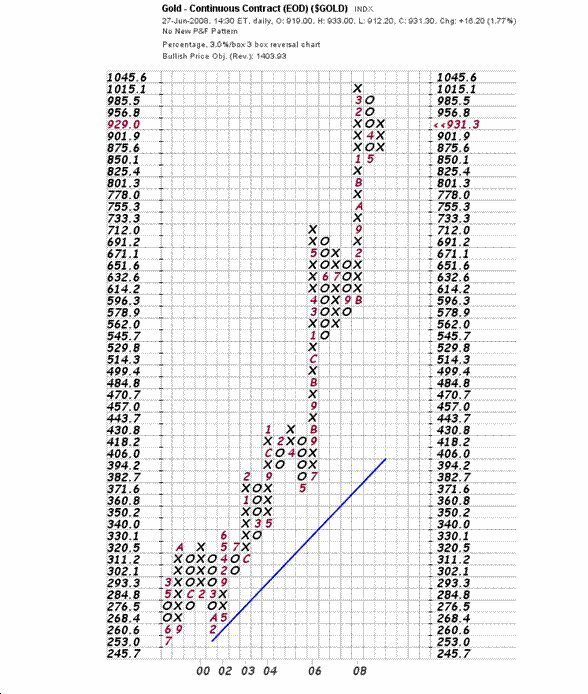 The chart below (courtesy stockcharts.com) shows a price target of $1,403.93 an ounce for gold. In light of all the above, whilst the gold price may pull back in the short to medium term, the $1,400 target is certainly believable – but without reference to time. Patience is the watchword. Peak Oil: Besides nuclear, there are at least eight alternative energy categories (and options within those categories) which might be mobilised to replace conventional fossil fuels, all of which will lead to a reduction of CO2. However, urgent action is required and priorities need to be set. Gold based technologies and Environmental Electromagnetic Energy scavenging technologies seem to be deserving of far more formalised attention and far higher priority. High lipid algae and hydrogen from solar/wind look very interesting. Climate Change: Whilst Climate Change is certainly occurring, if we prepare for an either/or scenario (either warming or cooling) then we will have a fall- back position in case we read it wrong. Betting the farm on (only) one outcome might lead to a “death or glory” situation. We cannot afford to gamble so irresponsibly. World Overpopulation: Going forward, this probably needs to be more actively managed. Perhaps a target of 8 billion should be “managed” similarly to the way China has been approaching the issue – but less draconian. The issue is skewed towards third world countries, which need to be supported. 2009 World Recession: This is a function of the politicians and bankers wilfully ignoring the facts that it is “wealth creation activity” that builds economic momentum and that “money” is merely grease for the economic wheel. Going forward, we need to separate these two camps in Society so as to avoid conflicts of interest; and to implement disciplinary consequences if fiduciary positions are abused. What has been happening in the past three decades has been outrageous from an ethical standpoint. Nuclear Power is not the way to go. The “politically motivated” push for nuclear as a solution is not predicated on solving problems. From a Global perspective, embracing nuclear will block solutions rather than facilitate them. The politicians’ inclination to support nuclear is predicated on their predisposition to entrench personal power bases. The oil price has more than quadrupled in the past decade because of one group’s predisposition to wield power over the rest of society. We need to learn from our mistakes. July 4th, 2008 (An appropriate day for public opinion to declare its independence from those who would seek to “control” it).